We are printing a partial list of Christian booksellers, listed alphabetically, who are linked with assemblies. Crary’s Christian Book Room. R.R. 3, Kirkfield, ON Canada KOM 2BO Phone 705 438 3335. Brother Crary has bound volumes of Truth and Tidings. 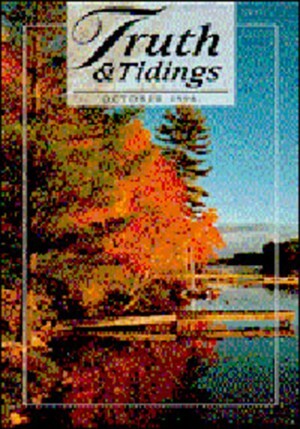 Gospel Tract Publications. 85 Portman St. Glasgow, G41 1EJ Scotland, Phone from North America 01144 141420 3207, Fax 420 3208. Wahls Bookstand. P.O. Box 195, Garnavillo. IA USA 52049 Telephone 319 964 2227 Fax 319 964 2104.